This is a collection of 13 pieces for piano based on poems penned by women. I ordered the book shortly before our move & packed it away without having the chance to play it. I finally was able to play through it the day the piano was delivered. All are lovely, easy to play, intermediate solos, and would be great for intermediate teen & adult students. 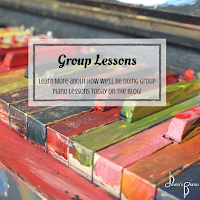 Have you ever considered group piano lessons? Well, if you're looking for a way to give your child piano lessons that are fun, engaging, and cost effective, group lessons can be a great way to go. And I am very excited to be able to start offering them in my new studio! 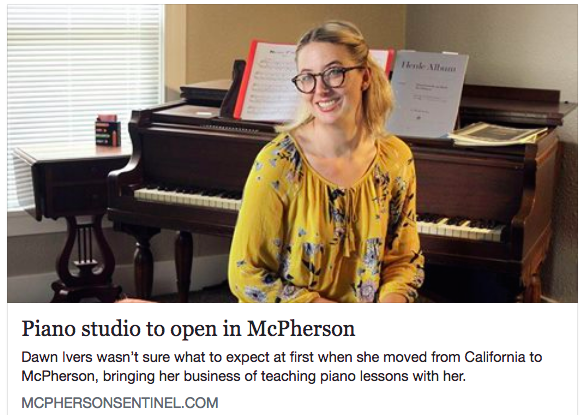 McPherson Sentinal: "Piano Studio to Open in McPherson"
With just 9 days until the first Open House, this is a special, quick mid-week blog post to share the news that Dawn's Piano was featured in the McPherson Sentinel! You can click the photo above or click here to read the full article by Patricia Middleton on the Sentinel's website. Open House - Dates Set! 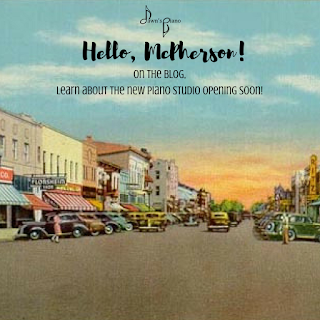 McPherson has a new piano studio! Want to learn more? Great! Because I'm opening up the studio for the community to come by & visit for two Open Houses - AND - if you sign up for lessons at the Open House, you will get 15% off your first payment, so stop by and tell your friends! 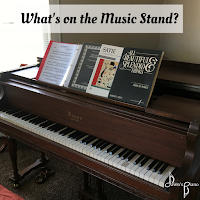 Stop by anytime to check out the studio, grab a light refreshment, meet the pianos & learn about what I offer for music students in our community. You can let me know you're coming with an RSVP on Facebook. Once again, the studio will be open all afternoon for you to stop by, enjoy a snack, & allow me to wax poetic about all the benefits of piano lessons. Stop in to learn more & decide if lessons might be a good fit for you! And again, you can RSVP to the Facebook event here. 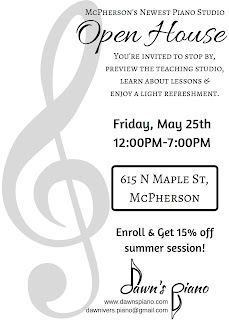 McPherson, there's a new piano studio coming to town! I have just moved here from Pasadena, CA. And after 12 years of teaching in Southern California, am working busily to set up my new studio in time for a summer session. This means if you are interested in piano lessons, send me a note! Or, share this info with your friends who might like to try piano lessons. First and foremost, I love music, and want you to love it too. Experience has shown me that those who are able to take joy from making music are able to carry it into the rest of their lives. I work hard to find the music students will love, and teach them the skills they'll need to harness that gift and carry it through their lives.